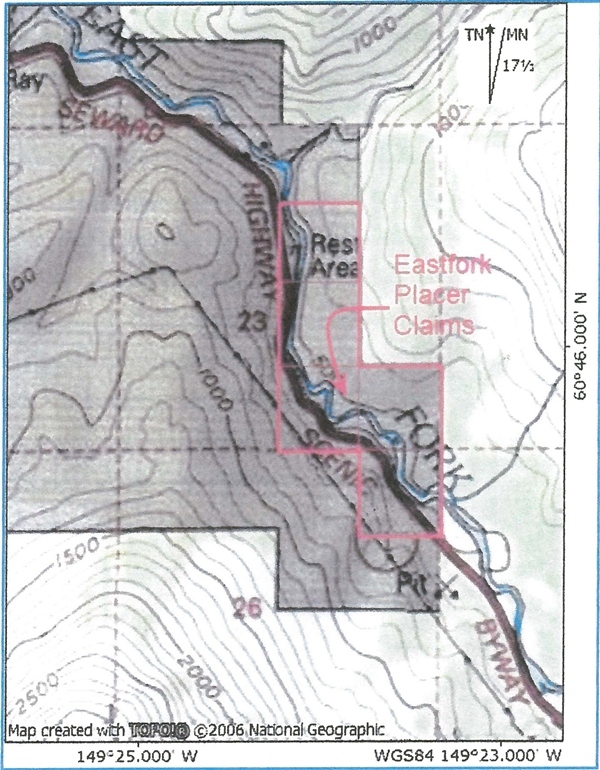 Hope Mining Company has five each 40 Acre State Mining Claims for sale in the East Fork drainage on Alaska’s Kenai Peninsula. All claims are conveniently located off the Seward Highway with access from the highway about one to two miles north of the Hope Highway turnoff. These easy access claims afford a world-class hand mining, dredging or mechanical mining opportunity within easy driving distance from Anchorage or Seward making them ideal for full-time, long-term mining operations or even the weekend warrior that wants his or her own claim for mining when it’s convenient. Some of these claims are classified as ‘open window,’ meaning mining in the creek is permissible year round, despite these being adronamous streams where dredging is usually only allowed between May 15 and July 15 each year. Hope Mining Company is asking for $12,000 OBO for each 40-acre claim and financing are available. A significant discount will be offered if all of the claims are bought at once. Financing is available.